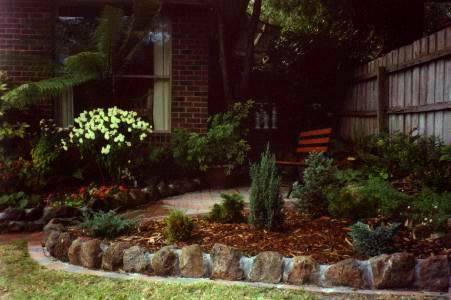 This is a newly paved area with a developing dwarf conifer bed. It was once a dark and dank corner with little of interest. Only moss and weeds could make a go of it in the deep shadows, as often happens in long established gardens. 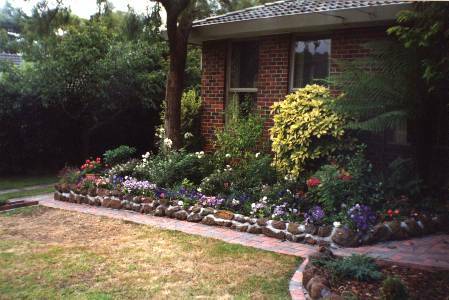 With the removal of a lot of the overhanging trees, the introduction of brick paving and the addition of new garden beds the area is now a lot more colourful and inviting, especially when viewed through the dining room windows. It has become a pretty area to look out on and should improve greatly as the new plants develop and grow to maturity. We can then cut out more of the older trees that made the area so dark and difficult.